This stylish assassin drama by director Joe Wright (The Soloist, Atonement) tells the story of Hanna, a teenage girl raised in the woods by her spy father, and who comes of age by evading the U.S. international spy network in order to solve the mystery of who she is. With a stand-out performance by Eric Banna (as the father), a deliciously arch villainess by Kate Blanchett (as Marissa, the head spy out to get Hanna), and an intriguing mix of girlish deadliness by Saoirse Ronan (as Hanna), the movie features strong principals and a decidedly Brothers Grim atmosphere of scary woods, carnivalesque cities, and even a wonderfully atmospheric appearance by the Big Bad Wolf. The script is a bit thin on substance – Hanna’s father toughens her up in the isolated woods in order to release her into the world where she will be a super-assassin, capable of simultaneously disarming tourists with her smile and disabling armed grown men three times her weight with a single karate chop. The rest of the script, the CIA chases after her through various exotic locales (again, remnants of the Bush administration here, as the new “cold war” thematic center on Arabian deserts and underground interrogation centers), while Hannah befriends a British family on holiday as a kind of cover, and learns what it means to be a real girl. What the script lacks in substance, however, the filmmaking more than makes up for in style. Wright’s wide landscape shots give you no familiar objects – so when Hannah first escapes into the desert, for instance, she could well be in Arizona as much as Afghanistan. Similarly, such context is stripped from conversations and city locales, so what we’re seeing could be happening ten years ago as much as today. Even though Hannah’s final destination takes her to Germany, it’s the Germany of fairy tales and goblins, a landscape ripe with visual metaphor, which Wright exploits to the hilt (going so far as to include a scene of one of Hannah’s friends hanging upside down from his Disneyfied mushroom house ceiling, shot through with arrows like a modern day St. Sebastian). The sensibilities behind this film don’t feel American as much as European – arch, disco-fied, with an undercurrent of political critique (Marissa, for instance, has a perfectly eerie Texas accent). Perhaps the best thing in this film is the music, which features none of the usual rock choices and instead choreographs Hannah’s violence with house rhythms and classical strings. With the music and the heavy visual symbolism, the whole the production has the air of an early 1990’s German art video. That may be too much style and too little substance for some people. 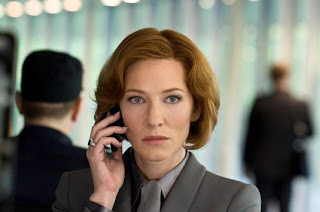 For me, I was fascinated by Blanchett's Marissa – a vulnerable bully, master spy, and wounded, surrogate mother – who chases after Hanna with ruthless efficiency, and masters just the right amount of Texas twang. She's one of our greatest actresses and it’s worth ten dollars to get to see her do her stuff. When you find out who Hanna really is and why Marissa is after her, it’s all a bit far-fetched/familiar, and something of a let down. But Marissa does get her comeuppance with one of the most interesting Brothers Grim visual metaphors in the movie.